Listen to Zach and Bill’s podcast reviewÂ of 10 mph,Â at Movie Bonfire. This opening quote sets the stage for the rolling road show that is 10 mph, the first documentary film from former members of the rat race Hunter Weeks and Josh Caldwell. Documenting the exploits of these two twenty-somethings on their Segway (a two-wheeled scooter device, for those unfamiliar with the concept), 10 mph explores America from Seattle to Boston and everywhere in between. As the guys set off from Seattle, hoping to average 60 miles a day, there’s something magical about the west that captures audience’s attention. The open roads and incredulous bystanders serves the filmmakers well on their quest to rid themselves of corporate America and steer themselves (and their cameras) to deeper revelations about the human spirit. Though their goal is partly accomplished – they did succeed in making, producing, and distributing an independent documentary on their own terms, about halfway through the film, they begin to lose steam. When their producer, a former friend, pulls funding and informs them that he will no longer be assisting them on their trip, things really start to fall apart for the guys, and for the film as well. Rather than explore the true sacrifices required to make something out of nothing, the filmmakers dive into their retirement funds and max out their credit cards, missing a ripeÂ opportunity to deepen the discussion of American ingenuity and creativity. Fortunately, the remainder of the film is lighthearted and enjoyable. We’re given enough time to like these guys, so it’s not a total turnoff when we’re shown their soft side. The film is filled with interesting characters. A pottery maker who opines on how Americans have forgotten how to “play,” an artistÂ who leads inner-city youth in an anti-graffiti painting crusade, and (best of all) a galling street cop in a Chicago suburb (Orland Park, to be exact) who serves as a perfect foil to the open-minded American spirit the film seeks to capture. Overall, Weeks and Caldwell have accomplished something admirable: a watchable, entertaining documentary that will hopefully launch them into the world of documentary filmmaking. Their next feature, an exploration of Fantasy Football, is already in the works. 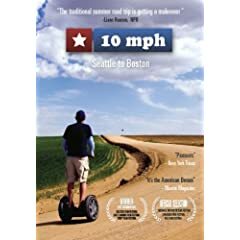 No user commented in " DVD Review: 10 mph – Seattle to Boston "